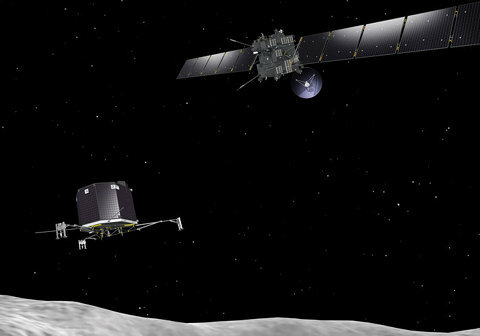 There’s a truly cool deep space mission that I need to bring to your attention: Rosetta. Visit ESA’s Rosetta page for details. Figure 1. Rosetta and Philae at comet [image: ESA–J. Huart]. The main scientific part of the mission is about to start, since Rosetta is getting quite close to its target comet, 67P/Churyumov-Gerasimenko. It will start mapping the surface of the comet in August 2014, attempt landing Philae in November 2014, and stay with the comet all the way through its closest approach to the Sun. The mission will end in December 2015. Also check out the really nice interactive version of this video: Where is Rosetta?. With the final orbit correction maneuvers happening around this time, now is a good moment to start following the Rosetta mission closely!